A specially written book for a quick and easy way to learn Hindi through English. the author should have added more pages. The information is very less. I have read other books of the author which are also good. 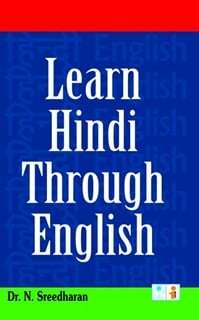 One can learn new language hindi by just knowing englishànice thought. Thanks to the author and the portal for making available such book. Book is good but only basics are given. It should contain more pages with more examples which can be used in day to day lives. Liked the book. Easy to learn and understand. I could talk simple sentences in hindi with the help of this book. I didn`t know hindi much before reading this book. For a long time I wanted to learn hindi. The author has to be thanked for giving such a book. The topics are good. Some dailogues are given which can be used daily. The meaning and pronounciation is also given. Book is handy to carry. I learnt few simple words with the help of this book which I can used daily while talking. The price is just 80/-. I purchased this book and found it very useful. I gifted this book to few of my friends interested in learning hindi. Thanks for the express fast in delivery. urgently i needed this book. in the second day from my booking day, this book was delivered in good condition. But two pages printing are not proper. that's ok. i can manage.